Occasionally, I like to pick a name from my family tree that I don’t have a lot of information on and see what I can find in GenealogyBank. Today, I picked the name of my great-great uncle Merwin Sniffen (1834-1924). Because “Merwin Sniffen” is such an unusual name, I figured that if there were any records that included this name, they would have to be my relatives. 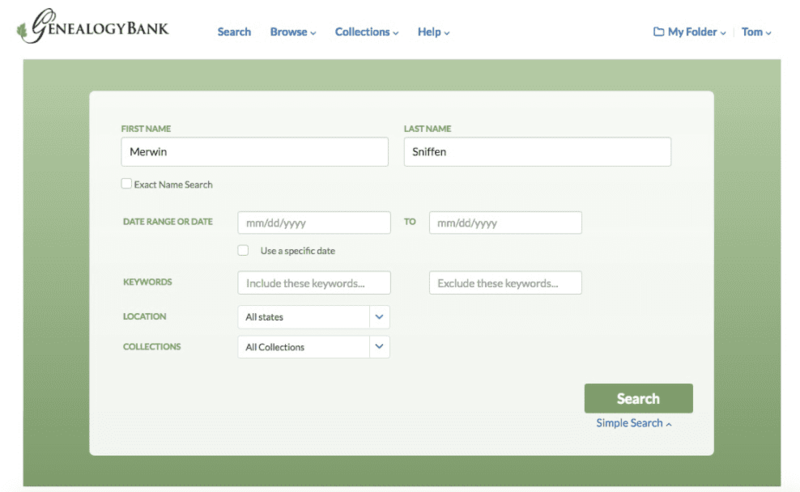 I started by simply searching GenealogyBank’s Historical Newspaper Archives for Merwin’s first and last names. 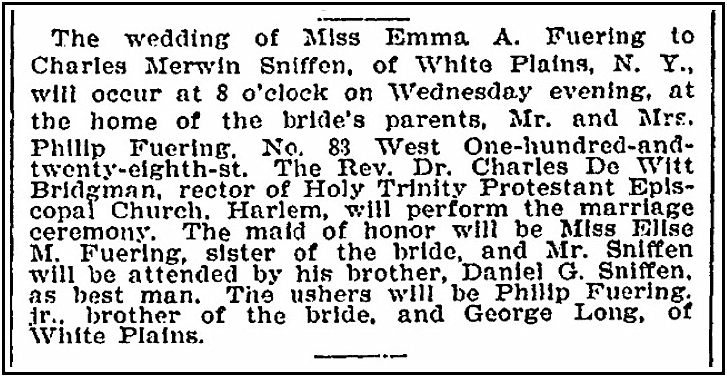 I quickly found this wedding announcement for Charles Merwin Sniffen and Emma A. Feuring. A quick look at FamilySearch and I learned that Charles Merwin Sniffen (1863-1926) is Merwin Sniffen’s nephew, the son of my great-great uncle Elliot Howard Sniffen (1828-?). This wedding announcement is very helpful because it not only provides me with Charles and Emma’s (1874-1949) marriage date – 9 June 1897 – it also gives me other information I didn’t have: the groom’s brother’s name: Daniel G.; Emma’s maiden name, Fuering; her father’s name, Philip; along with the bride’s brother and sister’s names: Philip and Elise M. Fuering. Notice the surname of the bride’s family, spelled in this newspaper article as it was pronounced/heard: “Fuering.” Digging deeper, I found that it was consistently spelled in all other family records as “Feuring” – a good reminder that you need to be flexible in searching for names because they might not always be spelled the same way from record to record. Also in my further research, I discovered that their first child was named Philip Leslie Sniffen (1898-1940), no doubt honoring the bride’s father and brother. Name patterns are everywhere. According to census records linked to his FamilySearch page, Charles was working in the grocery business in 1910, about a decade after his marriage to Emma. By 1920, he was working in retail, selling car tires. The family lived at 56 Mamaroneck Avenue, White Plains, New York. Charles died 9 August 1926 and was buried in the Kensico Cemetery in Valhalla, Westchester County, New York. Genealogy Tip: Because names are often passed down within families, searching for the distinctive names of your relatives will often lead you to discovering new information you can add to the family tree. I enjoy reading about your Sniffen family –- one of my Brick Walls is Sarah Sniffen/Kniffen/Niffen b. about 1792 in Westchester Co., married Hackaliah Vredenburgh (now there’s an unusual name!) about 1810 –- probably related, I keep hoping for a spark. Keep searching! Yes, sounds like we are cousins. I’ll keep a lookout for your line. Interesting name. Can’t say that I’ve seen Hackaliah – [Hachaliah (חֲכַלְיָה in the Hebrew) was the father of Nehemiah, the author of the Book of Nehemiah] in my family tree. Cool name. Will keep you posted as I find more about him.